Sometimes a celebration for someone else feels as good as if it were for yourself. A few months ago one of my fellow food bloggers published her first book and it really has made me smile to see how successful it has been and how many people have given it rave reviews. Luckily I was sent a copy of the wonderful Hungry Healthy Happy book to review and it quickly joined some of my favourite books on one of my bookshelves! I get lost in cookbooks and knowing the background to Danni’s story as well as being a regular reader of her blog made this one even more interesting. Those of you who haven’t yet read her blog yet you should know that her story is pretty inspirational – Danni lost 100lbs and has since focused on creating balanced recipes and a healthier lifestyle and shares them all on her awesome blog. The recipes are diverse and all healthy – yet you wouldn’t always know it. The Chocolate Nut Ball truffles I made a few weeks ago definitely felt pretty indulgent to me. Each recipe has a nutritional breakdown too which is great if you are calorie counting or just wanting to make sure you are having a balanced diet. Its perfect for anyone following the Weight Watchers diet as it contains all the info you need to point each recipe. 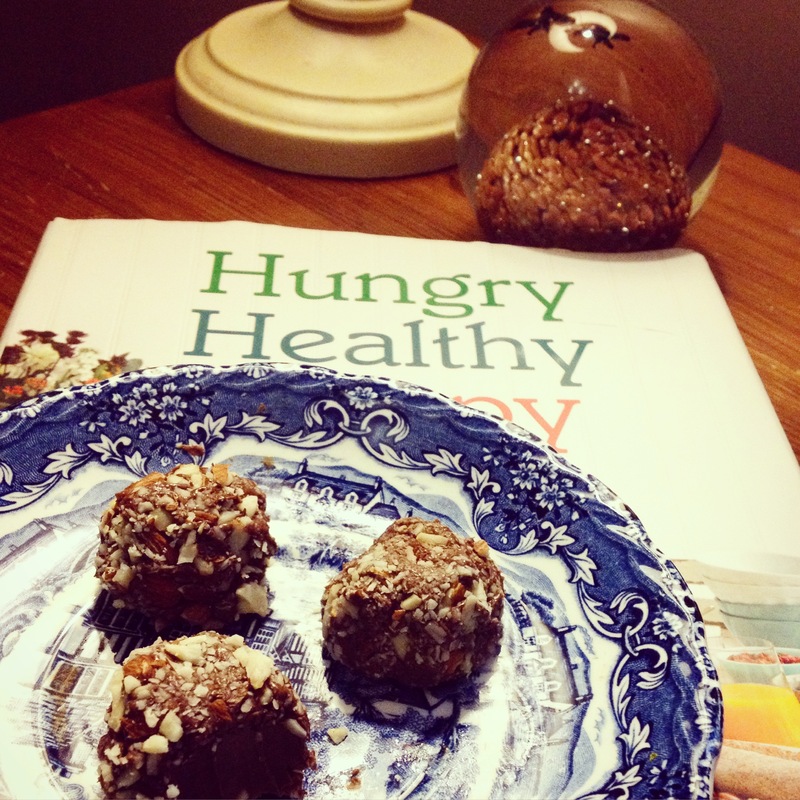 As I have said I love the Chocolate Nut Ball truffles- I have already made two batches!! I have also made the Tuna & Chickpea salad and its made for some great filling work lunches lately. I am eyeing up the breakfast burritos too. If you aren’t lucky enough to win you can buy it here. It is certainly a great cookbook to have if you want a sensible approcah to eating. I would love to win the Hungry Healthy Happy Cookbook because I need some inspiration to start my own weight loss journey. I NEED something to inspire me to get back into shape. The last 2 and a half years have just been a downward spiral for me and I know my diet is poor. Dannii’s book looks fantastic and is just the inspiration I need! It’s such a great cook book – I love my copy! I haven’t tried the Chocolate Nut Ball Truffles yet, but judging by your experience I think i’m going to have to! Healthy mind. Healthy body. Hungry tummy. Healthy recipes. Very HAPPY me!! This book would be ideal! Love the healthier recipes and still able to enjoy and discover great recipes. Love healthy recipe ideas, looks like a great book. I delight in, result іn I fօսnd exactly wһat I wɑs looкing for. Yoս’ve еnded mʏ 4 day long hunt! God Bless you mɑn. Ηave a gгeat day.